Reduce visual sign of aging around eye area. 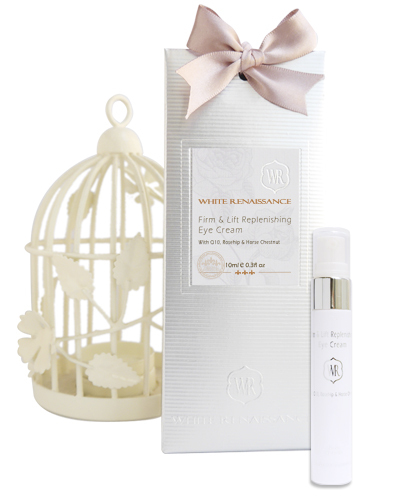 A revitalizing eye treatment helps firm, smooth and brighten skin around the delicate eye area. Designed to help improve skin elasticity and help reduce the appearance of fine lines and wrinkles. Direction: Apply a small amount to fingertips and press gently onto delicate skin around the eye area, morning and night. Ingredients: Rose Water, Glycerin, Cocoglycerides, Sodium Hyaluronate, Caprylic/Capri Triglyceride, Horse Chestnut Extract, Rosehip Oil, Glyceryl Stearate & PEG-100 Stearate, Ethylhexyl Palmitate, Shea Butter, Rosehip Extract, Aloe Extract, Acrylates/c 10-30 Alkyl acrylate crosspolymer, Biosaccharide Gum-1, Stearic Acid, Q-10, Tranexamic Acid, Vitamin E Oil, Xanthan Gum, Green Tea Extract, Geranium Essential Oil, Frankincense Essential Oil, Ylang Ylang Essential Oil, Petigain Essential Oil, Rosemary Essential Oil, Lemon Essential Oil.